In our nation's cities, small towns and urban communities, we are facing an escalating crisis with the continued growth of a generation of young people who often feel misunderstood and neglected. Many of these kids are being raised in environments where self-worth and hope for the future are destroyed. Their value system is developed by the polluted ethics, with little impact from positive adult relationships. 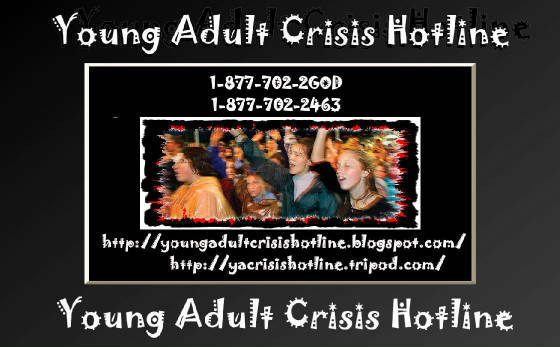 The Young Adult Crisis Hotline, we establish with this growing generation a relationship with Jesus Christ, construct a path for spiritual growth in their individual relationship with Christ. This is accomplished by providing an accepting non-judgmental atmosphere where clear and rational path in the midst of confusion can be given to them in order to serve them where they are at instead of forcing them into a mold. This truly allows us to assist them in gaining the skills, assets and attitudes they will need to reach their God-given potential in life. If churches do not "modify the approaches they use to influence the faith development" of this group, teens who grow up to be young adults will be "the least churched generation." Young adults are visually stimulated and respond to short chunks of information. That means a church that gathers young adults must be highly visual, fast-- flowing, and savvy about using communication tools that are familiar to them. And who should be doing the communicating? Well, the young people, of course. They are the best missionaries to their peers because they know the culture better than anyone. In youth culture, community and friendship trump everything else especially those from dysfunctional homes, value their friendships over their families. That's why we focus on building a strong community of friends that strongly welcomes young people who have little or no connection to the church. We continually remind our young people that the church must remain outward-focused or it will wither. We use our Groups meetings as an outreach tool, not simply as a discipleship strategy. Our Groups are the basic building blocks for reaping and keeping our young people. We tear down the cultural hurdles that scare away young people who are seeking Christ. If our goal is to introduce young people to Jesus, it's so important that we show them him, not an elaborate set of religious conditions. We must not ask these young people to culturally emigrate in order to follow Jesus. . There are many dark places in youth culture. But it should be our goal to redeem people who gravitate to those dark places, not avoid them like the plague. Darkness needs light. This generation of young people is crying out for Jesus. He's the only one who can truly fill the void that modern-day marketers promise to fill with products. We must clear away the fog that obscures the real truth-Jesus. The “Invisible Generation” of tomorrow, will be the driving forces in our society will look much like they do today, only magnified. We’ll live in a secular, materialistic, relativistic and self-absorbed culture. Many will be "third-generation unchurched." Christianity will be an alien world to them, and they won’t know much about the Bible’s story or message. At home, kids will have shallow, fragmented and often abusive primary relationships. The wealthy and the elderly will control most of our resources and power, making young people a vulnerable "fringe group." Life will grow even more complex, fast-paced, desperate and violent. Because of this, the transition from childhood to adulthood will be longer, more treacherous and full of risk. If you don’t give kids a road map to help them find their way in life, someone else will. And there’s a good Chance that "someone else" won’t lead kids "in the way they should go" (Proverbs 22:6). Young people will be fully secularized by the end of this decade; personal experiences will be their sole measure of reality. They’ll have little sense of what’s holy, but its absence will drive them toward what’s "spiritual.” Young people in the next decade will know little of trustworthy relationships. Most will be psychological orphans. They’ll need caring, listening, stable people and communities to help ease their "adoption" into God’s family. 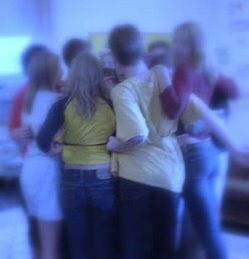 Peer ministry will be the crucial "glue" that helps kids stick with Christ. Meanwhile adult faith-mentors will be more important than ever. Rock music - and its many stepchildren - will continue to be a second language for teenagers and young adults. Its sounds and messages will form the boundaries of their world. And if you want to understand their culture, you’ll need to listen to their music. It’ll be hard to connect with desperate and disenfranchised youth if you don’t. Families in the 21st century will still be critical to teenagers’ psychological, social, moral and spiritual development. For some young people, the TOPEC Foundation's Young Adult Crisis Hotline and Biblical Counseling Center will be the only real "family" or intergenerational community they’ll ever know. Caring adults and peers can become surrogate parents, uncles, aunts, sisters and brothers. We have established a vital outpost of Christ in this very generation by starting the TOPEC Foundation's Young Adult Crisis Hotline and and Biblical Counseling Center. Though difficult, one of the most important tasks in ministering to youth will be equipping their parents for parenting. Nothing will shape the faith and attitudes of young people more than their parents’ self-esteem, parenting styles, moral stances and faith. Our Foundation can offer events and programs that strengthen family well-being, marriage relationships, and family communication, and discipline, faith-sharing and moral values. Unchurched, secularized young people will need young adult ministries that focus on the basics of the Christian faith and the fundamentals of leadership. Young men and women will be seekers. And the gospel message will be foreign and intriguing. So small group Bible studies, life-support groups, issue research or skills training seminars, outreach activities and public advocacy will give them the chance to care for one another, mature in their faith and prepare for leadership. The next decade’s high-tech, low-touch society will breed restlessness, emptiness, meaninglessness and hopelessness in kids. They’ll be searching for experiences that transcend the surface and touch them at their core. They’ll find those experiences in places of peace and solitude. In the last quarter of the 20th century, we’ve witnessed the privatization of the Christian faith. Beliefs and values have become individual matters; religion and ministry are confined to our "personal lives." The public arena has been left to TV executives, politicians, educators, scientists and economists - all purveyors of their own ideologies. This has left our society without positive moral direction and Christianity without significant witness and impact in the public arena. If Christianity is to make a difference among young people, it must publicly and assertively evangelize the next generations. We want to be this outpost of hope and encouragement to this “Invisible Generation”. A safe place where the can come as they are not having to change who they are to fit into the structured church environment. Can you help us to continue to expand the TOPEC Foundation's Young Adult Crisis Hotline and Biblical Counseling Center Vision? Your partnership with us is going to provide God an avenue to the most unreached generation. We together can make an impact in our next generation. Life after high school is quite different. Gone are the security and protection that comes from being underage and dependent upon others. Decisions and challenges take on new importance. In addition to undertaking numerous other life tasks, young adults in late adolescence and beyond search to find a faith that they can call their own. In many ways, they are alone in this endeavor for maybe the first time in their lives. Often their “searching faith” moves them away from the church of their birth. Many are wary of institutional religion as they grapple with questions about the purpose of life and what it means to be a Christian. In whatever way this searching manifests itself - be it an introspective reexamination of traditional beliefs, intentional religious education, rejection of organized religion, or functional atheism - young adults needs to know that the Church is there for them even though they may not be there for the Church. They need to know there is a place where they are welcome, where their doubts and questions are welcome, where they can find the support and fellowship of their peers. While acknowledging there are significant differences between the faith journeys of those in late adolescence and those in their late twenties and thirties, ministry to young adults should always be respectful of these differences and directed towards inclusion. There are no better mentors for those searching for a place to belong than those who have come through the doubts and questions into ownership of their Christ-Like identity and a growing maturity in the Christian faith. This generation of Young Adult's is one of the fastest growing groups in our community today. Many have recognized the need to reach out to people in their 20’s and 30’s, both married and single. With the need being so great and few options existing for people to find the answers, we have founded the Young Adult Crisis Hotline and Biblical Counseling Center an affiliate of the TOPEC Foundation. The Young Adult Crisis Hotline and Biblical Counseling Center provide vital services to the Body of Christ and the World that are at no charge. Donations are accepted but not demanded for counseling appointments. This has been evident in the Great fruit by God moving in the hearts of young adults to share the truth only found in Jesus Christ. Progress in this ministry is important; work must be done to touch the lives of young adults in this country and around the world. Together we have made significant difference! Let us know how we can better help you. Please, make comments on the website - what you liked or didn’t like. How can we improve the site to meet your needs or the needs of others?